My cycle to work is about 3.6km and takes maybe 15 minutes, which I think is about the perfect length. It's enough that I'm getting at least a small amount of regular exercise, but not so long that it ever feels tedious, and even on the rare occasions when there's serious rain (or it's dark on the way home in winter) it's not too daunting. It's also an attractive route, much of it quite pleasant cycling. I begin with a description, which I follow with some commentary on Oxford cycling infrastructure, on which it doesn't shed such a flattering light. Google Maps says my commute is 12 minutes by car (with no traffic) and 14 minutes by bicycle. In practice it takes me a bit longer than that on the bicycle and (even leaving around 11am) it'd take me that much or longer by car, depending on traffic — and that assumes the car is outside my house, which is often not the case, and that I could park it at work as conveniently as the bicycle, which I can't (I'd have to make a case for a parking permit, go on a waiting list for one, and then pay 1% of my salary for it, and even then there might not be a space in the car park behind my building). Then comes a long stretch on main roads. 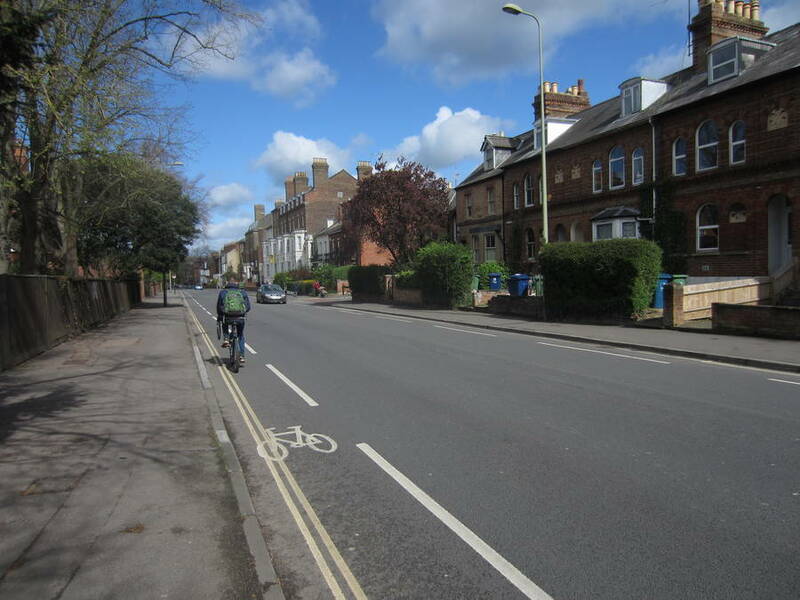 The section on Iffley Rd from James St to the Plain is mostly quite pleasant, with a continuous, smooth-surfaced cycle lane and double-yellow lines. The lane is, however, only 1.1 metres wide, in a 30mph zone initially, and sometimes one has to pull out to pass a stopped bus or a parked van or car that has ignored the parking restrictions. This is also a very busy (10,000+ motor vehicles per day, including many trucks and buses) road, and vehicles regularly enter the cycle lane to pass vehicles going the other way (this is unavoidable when there's someone parked on the other side of the street). I have blogged about this before. The Plain roundabout is fairly easy outbound, with no need to enter the central area of the roundabout; the only trick is keeping an eye out for traffic entering Cowley Place. From the crest of Magdalen Bridge I then engage in "vehicular cycling" all the way to Queen's Lane, attempting to hold the lane to stop overtakes in the over-narrow sections near the junction with Longwall and then staying right so I don't have to cross buses pulling in to the bus stop. Queen's Lane and New College Lane make up one of the nicest parts of the trip. 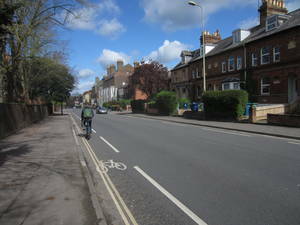 This route is slower but involves blind corners and is more dangerous (in terms of unweighted accident probability) than the alternative route via Longwall and Hollywell Streets, but any accidents here would be relatively low-energy ones involving pedestrians or other cyclists, not motor vehicles going too fast around the corners on the Longwall pinches. It also offers some lovely views: the squat tower of St Edmund'sPeter-in-the-East (now the library of Teddy Hall), walls covered with wisteria and cherry blossom in the right season, two bridges, and a nice approach to the Clarendon Building and the Sheldonian. I slow right down here, especially in summer when there are tourists all over the place; I remind myself that people travel long distances to see these sights and make a point of taking the time to look at them myself. Broad St sees relatively little traffic in the middle of the day and is mostly not unpleasant to cycle along, though I can't see myself cycling here alongside a four year old (as I have seen parents doing on a couple of occasions). Lorries loading can be a problem; cars waiting for parking spots and blocking the road while they do so are another. (I have commented before on the insanity of allowing 25 parking places to hold the entire space to ransom.) The junction of Magdalen Sts East and West with Cornmarket and George St is a mess, with huge amounts of pedestrian traffic which (understandably) rarely waits for the slow cycle of lights, a constant flow of buses, taxis, and a stream of cyclists (ultimately the only solution here is to somehow reroute the buses, which would involve relocating the main bus station from Gloucester Green). The main Beaumont St/St Giles junction throws in a traffic jam of cars, since it carries pretty much all the west-north private motor traffic, but at least there's plenty of space here and waiting at the lights actually makes sense. Then it's back to back streets (with occasional rat-runners) down Pusey St and St John St.
My return trip is fairly similar. The biggest difference is that I go down Turl St and nearly the length of High St instead of using Queen's Lane. This is my longest stretch of "vehicular cycling", as I stay to the right all the way down High St, to avoid pedestrians stepping off the pavement, cyclists entering too fast on the left, and buses pulling in to bus stops from my right, only moving aside if an insistent taxi tailgates me. At the Longwall junction I go down the right of any waiting traffic rather than the left, but only if I know I can get to the ASL before the lights change; otherwise I tend to stay back behind the motor vehicle column. I then sprint all the way to and around the Plain, trying to hold a place in the traffic so I don't have to go anywhere near the cycle lane outside Magdalen College. This has pedestrians stepping into it, out of town coaches and buses squeezing past in the pinch points (the local buses are pretty good about staying back), and other cyclists overtaking too closely (worried about traffic behind them) and must be one of the more dangerous bits of Oxford for cyclists. (I don't have hard data on this, but going by the stories I see in the Oxford Mail, this does seem to be a hot-spot for accidents.) And I stay in the car lane entering the Plain, to avoid having to cross motor vehicles heading for Cowley Rd while I'm taking the Iffley Rd exit. I'm not very fit, so I then trundle slowly up the slight incline on Iffley Rd to get my breath back. My commuting exercise follows a kind of Nassim Taleb 'bar-bell' distribution, with a few bursts of sprinting amid mostly leisurely stretches. My commute illustrates some of the problems with cycling in Oxford. This is my regular commute, so I know the route very well. I know which buses will pull in at which bus stops and know where the potholes are. There are stretches of it that I would approach quite nervously if I wasn't so familiar with them. I'm also a reasonably fit adult, and quite confident. If I wasn't able to sprint for short distances, or able to deal with occasionally being honked by aggressive taxi drivers (eager to get to the next stack of waiting cars a few seconds faster), then there are places where I'd be nervously cycling in narrow cycle lanes, with pedestrians stepping off the pavement on one side, buses overtaking too closely on the other, even slower cyclists just in front of me and faster cyclists overtaking too closely. I know several fit adults who can ride a bicycle but simply won't cycle routes like this. I certainly wouldn't trust an eight year old to cycle most of it unaccompanied, and would be worried even if I were with them. I once saw someone, with a toddler on a seat behind them, shepherding two six(?) year olds on their own bikes around the Plain, trying to get from Magdalen Bridge to Iffley Rd, but that was clearly quite a nerve-wracking undertaking, with the children coming to an uncertain stop half way between the St Clements and Cowley Rd exits (I blocked the roundabout to their right to cover them, and the car drivers cooperated). Otherwise I've never seen children attempting the Plain on bicycles — they, and a whole raft of other people, have no direct, practical cycling route from a whole swathe of East Oxford into the city centre. If Oxfordshire County Council is at all serious about increasing the number of cycling trips in Oxford then they will need to do something quite drastic to make routes like mine less intimidating for people thinking of cycling: they need to build infrastructure suitable for eight year olds, eighty year olds, and less confident thirty year olds. Richard Mann has used the Datashine Commute breakdowns of the 2011 census data and tells me that of the 632 people reporting as commuting from Oxford014 to 008 (roughly my commute) 260 travel by bike, 144 by bus, 160 by foot, and 52 drive. Given high-quality cycle infrastructure that largely kept them from having to interact with motor traffic, I think a good fraction of the 300 people walking or catching the bus would cycle instead. That wouldn't do much to improve the sustainable travel modal share (though it might free up room on the buses for people coming in from say the park-and-rides) but might improve their quality of life by offering them a faster or cheaper commute option. 1% of the annual salary for the privilege of a parking sticker? A bit rich. First time I heard of such an arrangement. Does it apply across the board or exemption for senior appointments ? The 1% is for all regular salaried employees of the university. I suspect that the vice-chancellor and other big-wigs just get their own personal parking spots, however, and don't actually need to have permits. What's your wet weather kit? Glad that you are fit and impressed with your bravery. I walk, slower, but in Sydney much safer. Thanks for the correction Stephen, I've updated the post.